All editions are beautifully designed and are printed to superior specifications; some include illustrations of historical interest. Barnes & Noble Classics pulls together a constellation of influencesbiographical, historical, and literaryto enrich each reader's understanding of these enduring works.Often considered Charles Dickens's masterpiece, Bleak House blends together several literary genresdetective fiction, romance, melodrama, and satireto create an unforgettable portrait of the decay and corruption at the heart of English law and society in the Victorian era. Opening in the swirling mists of London, the novel revolves around a court case that has dragged on for decadesthe infamous Jarndyce and Jarndyce lawsuit, in which an inheritance is gradually devoured by legal costs. 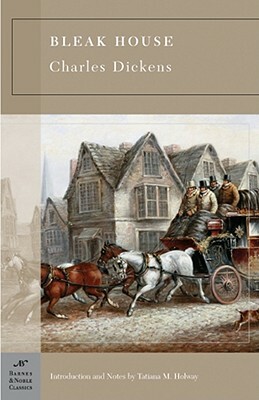 As Dickens takes us through the case's history, he presents a cast of characters as idiosyncratic and memorable as any he ever created, including the beautiful Lady Dedlock, who hides a shocking secret about an illegitimate child and a long-lost love; Mr. Bucket, one of the first detectives to appear in English fiction; and the hilarious Mrs. Jellyby, whose endless philanthropy has left her utterly unconcerned about her own family. As a question of inheritance becomes a question of murder, the novel's heroine, Esther Summerson, struggles to discover the truth about her birth and her unknown mother's tragic life. Can the resilience of her love transform a bleak house? Andmore devastatinglywill justice prevail?Tatiana M. Holway received her Ph.D. from Columbia University. A specialist in Victorian literature and society, she has published a number of articles on Dickens and has taught at a variety of undergraduate institutions.